Trilogy at Redmond Ridge is an ideal community for active adults who want to live in the beautiful outskirts of Seattle, Washington. 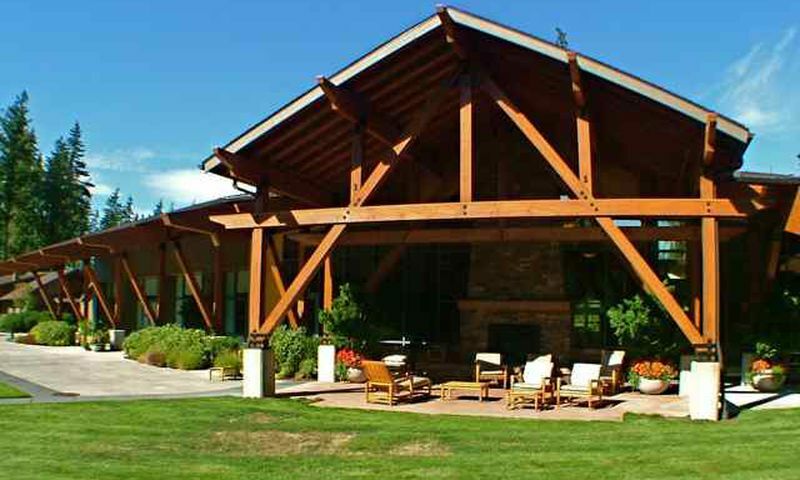 This 55 and better golf community provides spectacular views of the Cascade Mountains, a spacious clubhouse with many amenities, and a challenging 18-hole championship golf course. Trilogy at Redmond Ridge residents can stay in shape in the state-of-the-art fitness center and take classes at the University of Washington Center for Learning, while the Tranquility Spa nurtures both the body and spirit. Conveniently located on the outskirts of the city of Redmond, Trilogy at Redmond Ridge combines natural beauty with an active adult lifestyle. There are plenty of things to do both within the community and around town. Residents can also find world-class dining, shopping, and cultural attractions just 30 minutes away in downtown Seattle. Cascade Club, the community's 32,000 square-foot clubhouse, lies at the heart of Trilogy at Redmond Ridge's active lifestyle. Here residents can exercise at the state-of-the-art fitness center, take a yoga or aerobics class, or enjoy the indoor junior Olympic-sized pool and adjoining spa, which overlooks the nearby forest. When it's time to socialize, residents can meet up in the Cyber Café, attend one of the community events in the Grand Living Room, or play a game in the billiards and card rooms. Trilogy at Redmond Ridge also offers residents facilities to enhance the mind and spirit. The University of Washington Center for Learning provides a variety of lifelong learning classes, and the popular Tranquility Spa pampers residents with many relaxing services. The Golf Club at Redmond Ridge is a beautiful 18-hole championship course, designed by Gary Panks, which provides spectacular views of the Cascade Mountains. This par-70 course blends the natural beauty of the area with emerald fairways and challenging water features. Three tees are available for variable play. If tennis is preferred, the community offers four lighted professional courts. Trilogy at Redmond Ridge hosts 1,574 single-family ranch homes, designed specifically for active adults aged 55 and better. These spacious homes are available in a variety of styles, ranging in size from 1,295 to 3,082 square feet. There are four distinct series of homes within the community, each with their own variations, to reach a total of 15 different home models available as resale homes. All of the homes found within Trilogy at Redmond Ridge feature modern designs with large kitchens and open living spaces. Large windows and dramatic entryways are commonly found throughout the community, and some homes are situated on large, scenic lots with three-car garages. Designed by Shea Homes, all Trilogy homes are built with many eco-friendly materials and energy-efficient systems. Trilogy at Redmond Ridge is an ideal location for active adults, and the wide variety of activities allow residents to be as socially active as they prefer. Community events in the Grand Living Room are a great way for residents to get to know their neighbors and the 2,825 square-foot Crystal Event Room, with its courtyard overlooking the golf course, is the perfect location for a private party. Residents have many options for staying in shape, including golf, tennis, yoga and aerobics classes, swimming, and working out in the state-of-the-art fitness center. Social clubs let neighbors share interests such as photography, music or travel, while arts and crafts rooms provide the space to get creative with a new hobby. Lifelong learning is an important aspect of a healthy, active lifestyle. Trilogy at Redmond Ridge's residents can stretch their minds at the University of Washington Learning Center. Fine dining is close to home at the Crooked Spoon restaurant, which is located on the community's golf course. And, when it's time to unwind, residents can visit the full-service Tranquility Spa. Located just 20 miles east of downtown Seattle, Washington, Trilogy at Redmond Ridge is ideally situated between the Cascade Mountain range and Puget Sound. Residents can enjoy both the natural beauty of the surrounding forests, rivers and protected wetlands, and the convenience of local shopping and services. A shopping center with a full-service grocery store is located across the street from the community and just down the road, residents will find a Target, Home Depot, and urgent care facilities. The surrounding city of Redmond is ideal for active adults. Known for its bicycle-friendly design, the city features twelve miles of beautiful biking and hiking trails as well as large lakes for boating and fishing. Downtown Redmond offers many local dining and shopping opportunities, and residents can find even more to do in nearby downtown Seattle. Only 30 minutes away, Seattle offers world-class dining, shopping, sporting venues, and cultural attractions. Some attractions include the Seattle's Space Needle, Pike Place Market, Seattle Seahawaks, Seattle Mariners, Seattle Sounders, Seattle Storm, Seattle Symphony, and McCaw Hall. Trilogy at Redmond Ridge is the ideal active adult community in Western Washington. The Cascade Club is a 32,000 square-foot facility at the heart of Trilogy at Redmond Ridge. Here, residents can stay socially and physically active. Cascade Club - 32,000 Sq. Ft. The Golf Club at Redmond Ridge is the essence of the perfect golfing experience. Residents can join the club for an additional discounted price. There are plenty of activities available in Trilogy at Redmond Ridge. Here is a sample of some of the clubs, activities and classes offered here. The Lakes Collection offers the smallest homes within the community that range from 1,285 to 1,871 square feet. Homes feature one to three bedrooms, two to two-and-a-half bathrooms and an attached two-car garage. There are four single-family models offered in the Island Collection. Homes in this collection range from 1,568 to 1,925 square feet with two to three bedrooms, two bathrooms and a two-car garage. The Forest Collection offers three floor plans that range from 2,161 to 2,306 square feet. Homes in this collection feature two to three bedrooms, two to three bathrooms, and a two to two-and-a-half-car garage. The Estate Collection is the largest homes within in the community with 2,496 to 3,082 square feet of living space. Homes feature two to three bedrooms, two-and-a-half to three bathrooms and a two-and-a-half-car garage. We moved here in August 2010 and felt immediately welcome. There are over 40 activity groups and a wonderful public golf course. The monthly HOA cost is very reasonable for the services provided. As of this writing there are only six out of 1,500 homes left to build. 55places.com is not affiliated with the developer(s) or homeowners association of Trilogy at Redmond Ridge. The information you submit is distributed to a 55places.com Partner Agent, who is a licensed real estate agent. The information regarding Trilogy at Redmond Ridge has not been verified or approved by the developer or homeowners association. Please verify all information prior to purchasing. 55places.com is not responsible for any errors regarding the information displayed on this website.